OUR ARTISAN METHOD OF AIR DRYING TREATS STARTS WITH HAND TRIMMiNG FRESH CUTS OF USDA INSPECTED MEAT. FROM THERE, WE FLASH FREEZE tO NATURALLY PRESERVE THE NUTRITIONAL INTEGRITY & FLAVOR OF EACH PIECE OF MEAT. ONCE FROZEN, THIN SLICES ARE CUT & LAID OUT TO GENTLY AIR DRY FOR UP TO 3 DAYS IN OUR CUSTOM BUILT DRYING ROOM. THERE IS ABSOLUTELY NO HEAT APPLIED & AT NO TIME IS THE MEAT COOKED. OUR SPECIALLY FORMULATED RECIPE FOR AIR DRYING REMOVES MOISTURE AND ALLOWS OUR TREATS TO RETAIN THEIR RAW NUTRITIONAL QUALITIES WHILE REMAINING SHELF STABLE AT AN AMBIENT AIR TEMPERATURE. 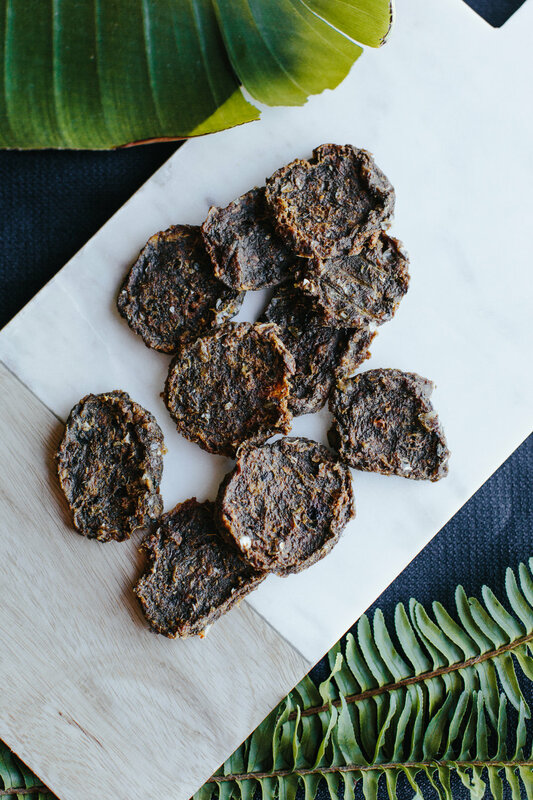 IN KEEPING WITH OUR COMMITMENT TO QUALITY, SOUL'Y RAW SINGLE PROTEIN AIR-DRIED TREATS ARE HAND CRAFTED USING AN AGE OLD METHOD OF PRESERVING MEAT. BY AIR DRYING THIN STRIPS OF MEAT & FISH THE MOISTURE IS REMOVED, WHICH INHIBITS THE GROWTH OF PATHOGENS, WHILE RETAINING THE INHERENT VITAMINS, MINERALS, & ENZYMES FOUND WITHIN RAW PROTEIN. SOUL'Y RAW AIR-DRIED TREATS ARE GREAT FOR ALL BREEDS OF DOGS & CATS- ESPECIALLY THOSE WITH DENTAL ISSUES, SENIOR PETS, AS WELL AS PUPPIES & KITTENS. BECAUSE THE TREATS SOFTEN FROM THE SALIVA FOUND WITHIN THEIR MOUTH, ALL OF OUR AIR-DRIED TREATS CAN BE EASILY CHEWED, SWALLOWED & DIGESTED. THE PROCESS OF AIR DRYING RAW PROTEIN INVOLVES REMOVING MOISTURE USING EVAPORATION, NOT HEAT. THIS NATURALLY PRESERVES THE MEAT IN IT'S RAW STATE & PREVENTS ANY DAMAGE OR CHANGE TO THE COMPOSITION OF THE PROTEIN. THE PROCESS OF DEHYDRATION INVOLVES COOKING THE PROTEIN WITH CONTINUOUS HEAT AT A LOW TEMPERATURE.